Break the chocolate into small pieces, put it in a bowl over a pan of very hot water and leave it to melt. Whisk the soya cream until it is very thick and well aerated. Fold in the melted chocolate, add a few drops of peppermint oil, then mix it thoroughly. 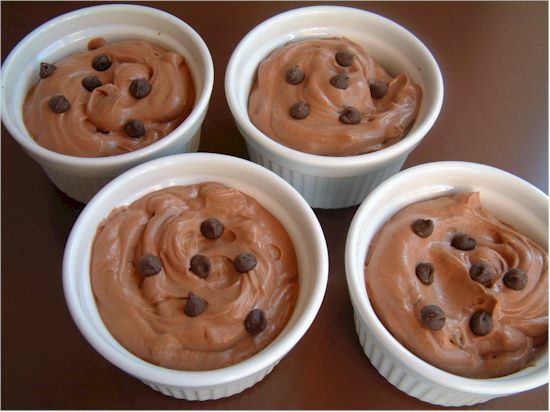 Spoon or pipe the mousse into individual dishes and decorate with dairy-free chocolate chips or a little grated chocolate. Cook’s Notes: You can replace the soya cream with oat cream. Alisa’s Notes: In the U.S. soy cream and oat cream can be hard to come by. But you can use MimicCreme or Coconut Milk for an equally rich and creamy product, if nuts or coconut are not a problem for you.